Finance is a core part of the Paris Agreement. It is key to enabling more ambitious action from all countries that the recent IPCC report warns is urgently needed. For developing countries, particularly the poorest and most vulnerable to climate impacts, finance is an urgent necessity to adapt to a warming world. Finance is also critical for developing countries to do their share in reducing the greenhouse gas emissions that cause climate change. COP24 in Katowice, Poland, is the most important round of climate negotiations since the Paris COP three years ago, in part because governments are tasked with agreeing on the key guidelines necessary to implement the Paris Agreement. Three finance issues will occupy center stage in Katowice: the funds, the rules and the goals. 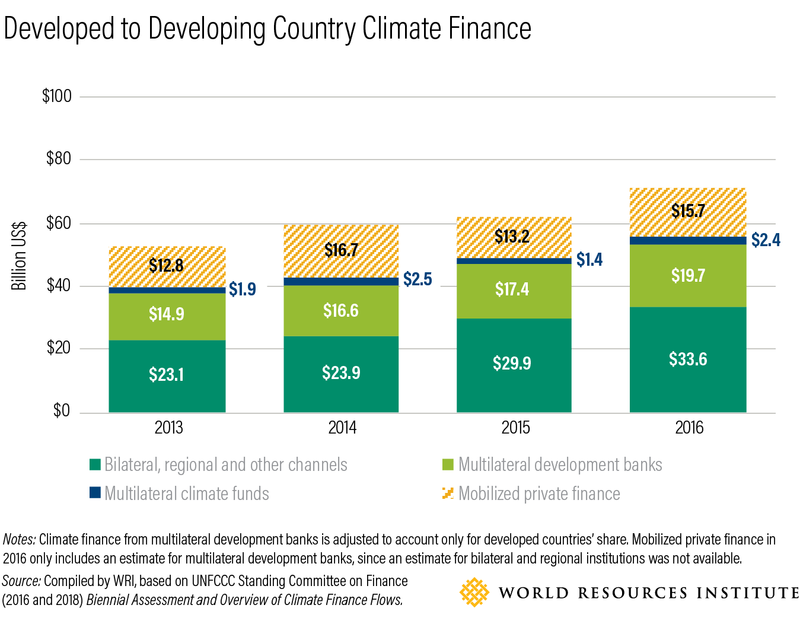 Climate-dedicated funds play an important role in getting finance to developing countries. Collectively, they provide targeted support for climate action using a range of instruments, often taking on more financial risk than other institutions. At COP24, developed countries will need to send clear signals that they intend to scale up support for developing countries, including to funds that explicitly support the Paris Agreement. Specifically, richer countries need to commit to an ambitious replenishment of the Green Climate Fund, the biggest of the dedicated climate funds. Germany has led the way by announcing its intention to contribute €1.5 billion ($1.7 billion), a doubling of its first commitment to the Fund in 2014. Countries should also make pledges to the Adaptation Fund and Least Developed Countries Fund, which support vulnerable countries with much-needed adaption efforts. Finally, countries need to finalize technical details for the Adaptation Fund to serve the Paris Agreement. Ex-post reporting on past support flows. Developed countries are required to report on support provided, as well as mobilized through public interventions. Other contributors are encouraged to do likewise. The Paris Agreement also encourages developing countries to report on the support they have received, including its use, impact and estimated results, as well as on their unmet needs. Negotiators need to develop reporting guidelines that improve upon existing requirements to ensure better information on finance flows and effectiveness. This, in turn, can help make the case for further support. In particular, there's a need for better tracking of how private finance is mobilized by public interventions, since approaches and estimates of this vary widely. It would also be helpful to reduce the current two-year lag time between when funding flows and when it must be reported to the UN. Ex-ante projections of future funding. Developed countries are required to communicate indicative information on finance to be provided and mobilized every two years, while other countries providing finance are encouraged to do the same. This information can help build trust among developing countries that the support promised in the Paris Agreement will be forthcoming, giving them the confidence to make more ambitious plans in future NDCs. Negotiators need to identify the types of financial information relevant to developing countries while respecting the national budget processes of contributor countries. In some cases, legislative processes may prevent them from making detailed forward-looking financial forecasts. Some developing countries have also emphasized the need for a process to consider the information received from countries' communications. This is related to a concern that after 2020, there are very few formal processes where progress on finance can be discussed. One option negotiators could consider would be to continue the biennial high-level ministerial dialogues on finance, which could provide an opportunity to look at all finance information, both ex-ante and ex-post, and identify further action needed. Currently, UN climate negotiations focus on public funding from developed to developing countries. However, one of the Paris Agreement's three long-term goals is to make all finance flows consistent with low-emissions and climate resilient development. So while tracking public funding is critically important and will continue to be so, it is only part of the picture. It would be like only looking at carbon dioxide emissions from developed countries; carbon dioxide is certainly a key driver of climate change, and developed countries are some of the largest contributors, but without looking at all greenhouse gases and all the major emitters, we won't successfully address the problem. Therefore, negotiators must also ensure the Global Stocktake, the collective assessment of progress that will take place every five years, looks at progress in making all finance flows consistent with climate goals, and allows inputs from the wide variety of sources that have the necessary data. The current goal: In 2009, developed countries pledged to mobilize $100 billion a year in climate finance for developing countries by 2020. That goal was reaffirmed in the Paris Agreement and countries pledged to continue mobilizing at this level until 2025. Last week’s publication of the 2018 Biennial Assessment of Climate Finance showed that finance provided and mobilized by developed countries reached over $70 billion in 2016; of this, $55.7 billion was public finance. Today, the Organization for Economic Co-operation and Development released data using a more conservative accounting approach that nonetheless shows public climate finance from developed to developing countries reached $56.7 billion in 2017. Our earlier blog this week looked at the data in more detail and emphasized the need for developed countries to provide further assurances at COP 24 that the goal will be met by 2020. The future goal: In Paris, governments also agreed, prior to 2025, to "set a new collective quantified goal from a floor of $100 billion per year, taking into account the needs and priorities of developing countries." Discussion about how and when this goal should be set is likely to come up at COP24. A look at past global goal-setting exercises can be useful in figuring out a reasonable timeframe: the mandate to develop what became the Sustainable Development Goals was issued at the Rio+20 Summit in 2012, and the 17 goals and 169 targets were finalized in 2015, so a three- or four-year period seems reasonable. Discussion of future funding levels and contributors this year would therefore seem a bit premature, especially since the governments who sign off on the eventual commitment in several years' time may be different to the ones currently negotiating. However, a procedural decision at COP 24 could set the timeline for deciding the goal, while leaving options open. One final thing makes this an important COP for climate finance: the Biennial High-Level Ministerial Dialogue on Climate Finance will take place on December 10 to provide a space for ministers to assess the state of play on climate finance, identify further action needed and make new pledges and commitments, which can all help unlock progress in this critical round of negotiations.